Hancocks was established in Manchester in 1860 by Josiah Hancock who provided clock winding services to the Mancunian gentry where he visited country houses and mansions to maintain the clocks of the aristocracy. For this time period owning a timepiece was a statement of wealth and authority, a quality that still holds prominence with Hancocks to this day. Due to great success a second Picadilly store was opened in London shortly after, with over 150 years in business Hancocks is now serving it’s third generation of loyal customers, a credit to their impeccable reputation and eye for design. Georg Jenson designs feature crafted silver jewellery at very affordable prices to meet a variety of cultures and tastes. They have a delightful range of key rings, all humourous and iconic, which are designed to stand out and make keys easy to find. This beautiful £30.00 mirror finish Space key ring puts me in mind of raindrops with it’s fluid curves and tear shaped ends, and my house keys have never looked so sleek nor been so fashion forward. Everybody comments on how unusually quirky and pretty it is and asks me where I got it. Hancocks recently celebrated their renowned To Have And To Hold wedding event in their flagship Manchester store, where future blushing brides could try on wedding bands and engagement rings in a stunning range of gold, platinum, palladium and titanium. A member of staff also presented a £142,000 yellow diamond engagement ring to the gasping attendees who feverishly shared stories of their proposals, fairytale hopes for their wedding day and had the opportunity to try on bridal jewellery, from diamond encrusted rings to pearl earrings and necklaces, a unique and incredible experience for all. Each handmade piece of jewellery is made to measure to suit an individuals needs and hand sourced by Hancocks to ensure the highest quality and finish is always achieved, creating a one-off piece that is as unique and loved as the person it is intended for. 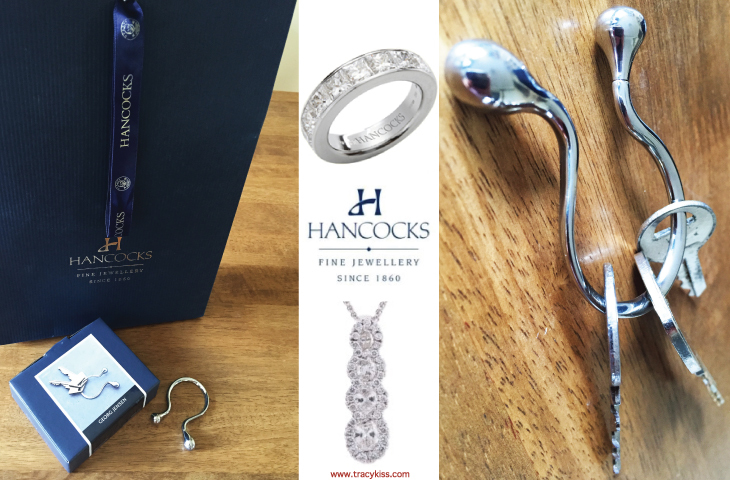 Whatever your occasion or budget, Hancocks has many stunning pieces to suit your needs, from graduations to driving tests, birthdays, engagements, weddings and anniversaries. It’s a tremendous thing to give a gift that is cherished and worn everyday, reminding that special somebody just how much you love them.